The Aureon Network Services Scholarship Program is available to students pursuing a STEM-related course of study and those residing in the trade area of an Iowa Independent Telecommunications Company. The application deadline is midnight April 30, 2017. A resident of Iowa and live in the trade area of an Iowa Independent Telecommunications Company. Iowa high school junior or graduating senior in the 2016-2017 school year. Accepted by an Iowa-based, accredited four-year college or university, community college, or vocational-technical school and be pursuing a STEM–related course of study. Have a minimum 3.33 GPA. A copy of a recent transcript may be requested. Relatives of those employed by the Independent Telephone Companies or Aureon are not eligible. A short essay describing why you are pursuing a STEM-related field (1,000 characters or less). A summary of your high school and community service activities, including leadership roles (500 characters or less). Visit https://www.surveymonkey.com/r/AureonTechScholarship to complete the application form. To be considered a candidate for the Aureon Network Services Scholarship, please complete and submit the application by no later than midnight April 30, 2017. All students meeting the eligibility requirements and submitting a complete application will be considered. The profile of the scholarship winners varies based on the applicant pool. Scholarship awards will range between $500-$1,000. Scholarship awards will be announced after all submissions have been reviewed. Winners will be notified by phone, email, or letter. 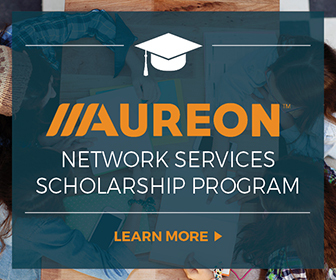 Questions regarding the Aureon Network Services Scholarship Program should be sent to corporatecommunications@aureon.com.